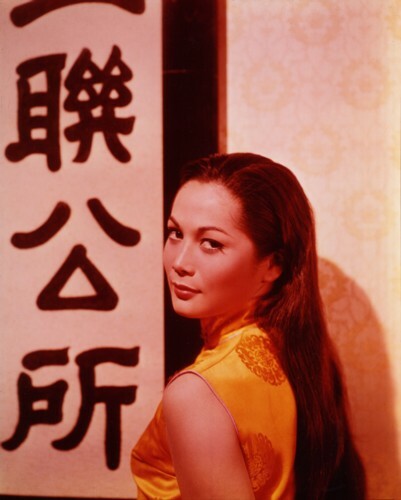 Qipao Love: Part 7 ~ When Qipao clad Nancy Kwan became the iconic 60s siren! 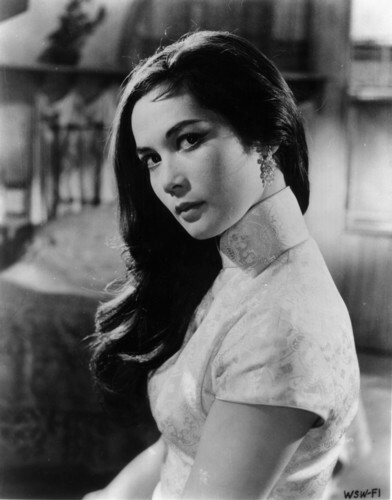 Originally taken on as an underwriter, Nancy was surprised with the leading lady role in 'The World of Suzie Wong'...interesting enough it seems luck took her on a path of discovery through most of her life. Born to an English fashion model mother Marquita Scott and Hong Kong Chinese architect father Kwan Wing Hong on the 19th May 1939, Nancy Ka Shen Kwan is an interesting Hollywood siren to say the least! Having survived World War 2 with her family and her parent's divorce at a young age, she was a spirited child who learned Tai Chi, enjoyed horse riding with her pony and diligently aspired to be a ballerina with hours of ballet practice every day. Studying at the prestigious Royal Ballet in London, she performed in Swan Lake as well as Sleeping Beauty, gained a qualification to teach ballet and eventually returned to Hong Kong to start a ballet school. Though not intending to become an actress or singer, she was spotted by Hollywood producer Ray Stark whilst in Hong Kong...a screen test followed and the twenty year old Nancy was then signed and sent to further her training as an actress...so the rest pretty much became history! 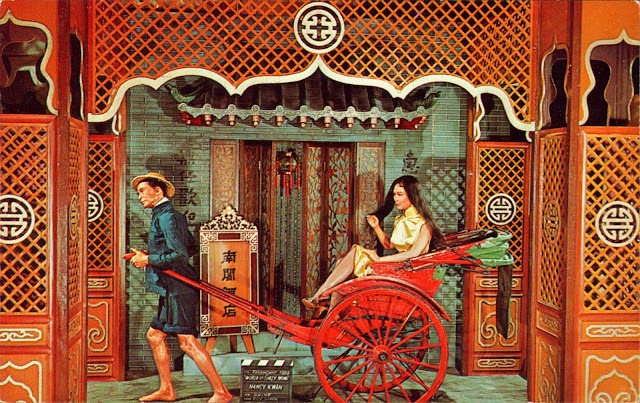 Video (above): Nancy singing the 'Cloud Song' in the 'World of Suzie Wong' (1960). 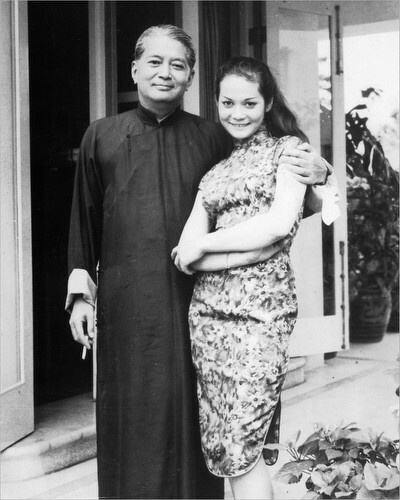 Publicity photo in 1960s...Nancy Kwan with her father Wing Hong Kwan. Famous Vidal Sassoon bob - Vogue 1963 by British photographer Terence Donovan. One last fascinating bit is known as 'The Kwan' ...in 1963 Nancy was spotted with a new daringly geometrical short bob designed by London's Vidal Sassoon that caused quite a stir and the 'Kwan bob' was featured in both the American as well British Vogue editions (photographed by the late Terence Donovan) starting off a frenzied following! Hopefully you darlings have enjoyed reading this post about an interesting Hollywood siren who has been compared to the great Anna May Wong...I must say a big THANK YOU for all the wonderful comments as well as likes on my previous 1950s inspired Batik Qipao look (Part 6 of 'Qipao Love')...I can't even begin to tell you how much your kind support means to me! Also I finally had my first Qipao Tea Party to celebrate Chinese New Year with a few friends...we had a marvelous time with a beautiful pot of Blue Blossom Earl Grey as well as a spot of red velvet cake at Camellia's Tea House in Covent Garden (London). [You can catch up with the photos on the Timothy Ward Photography Facebook page here: www.facebook.com/Qipao-Tea-Party] And, if you happen to be in Asia or have been enjoying the last celebratory fifteenth lunar day of the new year (which was Sunday)...Happy belated Chinese Valentines Day! There is so, so much ravishing beauty in this post. I'm so impressed by your depth of knowledge about qipao. Forgive me if I mentioned this in a past comment (I can't recall if I did, or if I just thought it to myself), but I think you could seriously write a book about the history of qipao at this point, darling gal. *PS* Thank you very much for your caring, lovely comment on my vintage outfit post this week. I really appreciate that you shared with what you did. wow honestly i have to say i never heard about nancy kwan, but she looks so outstanding beautiful!!! i adore especially that yellow qipao!!! and the hair is beautiful!